Eulene Bradford, 92, of Damascus, passed away December 5, 2018. She was born February 1, 1926 in Damascus, to the late Joe and Bessie Leonard. 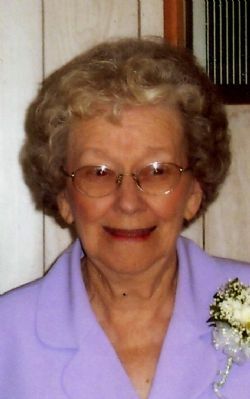 Eulene was a lifelong member of Damascus Church of Christ. She was a homemaker; she loved her family and cooking. Eulene is survived by her sons, John L. Bradford (Sharon) of Damascus , Gary Bradford (Becky)of Damascus, and Bruce Bradford (Cindy) of Plumerville, seven grandchildren, Jonna Moore (Scott) of Quitman, Don Bradford (Shannon) of Guy, Tonya Force of Damascus, Greg Bradford (Kinsey) of Damascus, John Price (Erin) of Fayetteville, Cody Bradford (Aliceson) of Perryville, and Miranda Potts (Joey) of Alma, twelve great grandchildren, and one great great-grandchild, and many more family and friends. She is preceded in death by her parents, husband, John Bradford, brother, Joe Leonard, three sisters, Lucille Leonard, Wilma Black, and Imogene Leonard. Visitation will be at 12:00 PM Saturday, December 8, 2018 at Greenbrier Church of Christ. Funeral Service will begin Saturday at 1:00 PM at the Greenbrier Church of Christ with Burial following at Bee Branch Cemetery. Click Play below to view the Video Memorial for Eulene Bradford. If you would like to order a DVD copy of the video, please contact the funeral home at 501-679-2575.